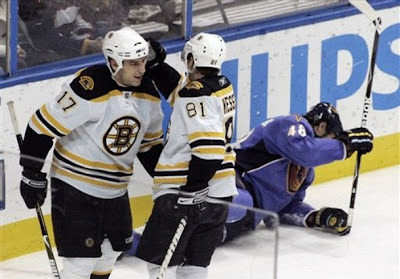 This is the last time the Bruins play the Thrashers this season. The Bruins are 3-0-0 against them this season. There's a little matter of the end of the NFL regular season. We'll know how the pats did in their game by the time the puck drops in Atlanta. I'm totally mailing this one in. The Bruins should not do the same. Game 8: Bruins win 5-4 at home, Lucic gets a hat trick. Game 29: Bruins win 7-3, there are 4 fights. Bruins chase backup backup goalie Pavelec on 3 goals in 4 shots, including a Chara wraparound goal. Game 30: Bruins win 4-2 and Chara gets 17 minutes in the Penalty Box for sticking up for Kessel. After the Game, Coach Claude says he thought it was a good decision. NESN First Shift: "Manny Fernandez (11-2-1, 2.09) vs. Johan Hedberg (6-7-2, 3.56)"